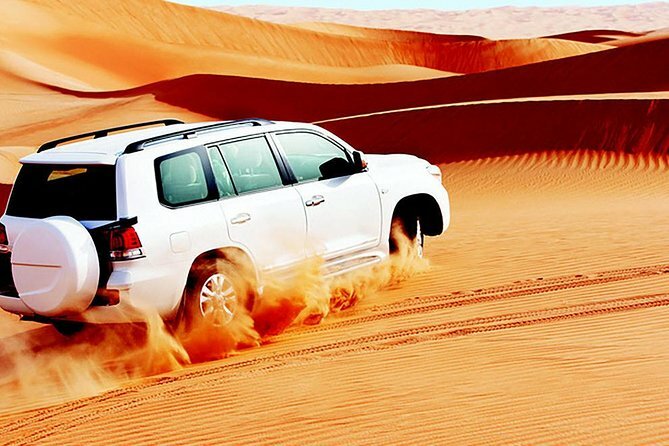 Explore the Desert for the evening and enjoy thrilling activities on a 6 to 7-hour desert safari on the red dunes. Drive across the red sand dunes by 4x4 vehicle. Slide through the high dunes on a sand boarding. Experience a breathtaking roller coaster on the red dunes . Enjoy an adrenaline rush ride as you slide across from one dune to another in the 4x4 vehicle. Venture deeper into the desert for the best scenic views possible, then stop for a picture on the highest dune at sunset To add more fun, set your foot on the Sand Board and glide on the dunes. A camera is absolutely a must-have so not to miss miss this experience and admire the 360 views of the desert landscape as the sun slowly sets down. Proceed to the desert camp for camel ride, falcon photograph, buffet dinner with BBQ & more. The climax of the evening is the stunning performance by the exotic belly dancer, Tanoura dance under the star-lit sky. - During the Holy Month of Ramadan NO Entertainment & Alcohol Drinks as per Government guidelines. If you are feeling truly adventurous, opt for the high dunes, the golden sands option where the level of the dunes is increased. The adventure drive continues for atleast 30 to 40 minutes followed by other activities waiting at the campsite such as a camel ride henna paint entertainment shows and more. The climax of the evening will be the stunning performance by the exotic belly dance and Tanoura dance under the star-lit sky (except during religious holidays and the Month of Ramadan).